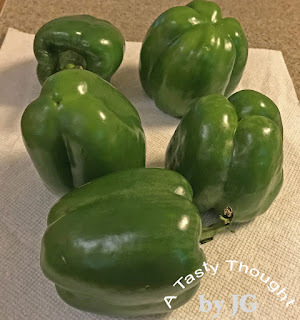 Last September when fresh local Green Peppers were available to purchase at roadside stands or in the grocery stores, I did not purchase any to freeze. Every year I do, but it just never happened. 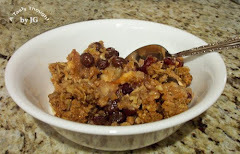 Oh, did I ever miss them this past winter whenever a recipe called for chopped Green Pepper! I always like to freeze the pepper strips and use them in entrees whenever that veggie is an ingredient in a recipe. No, I don't like to purchase that veggie in the cold winter months. They just never look that good in the grocery stores. Because I did not have them, it seemed that I needed them! Well, this past week I took some action! The first 5 Green Peppers were purchased/ prepped and found their way into our freezer. Three days later 5 more were purchased and 5 more little bags of pepper strips were prepped and frozen. It's quite a simple process. After cutting the Peppers into strips, the strips are placed in sandwich bags and then in a large freezer bag. Whenever one package is needed, it is at my fingertips. * * * For me 1 fresh Green Pepper = 1 little sandwich bag of ready to use Green Pepper strips. The Green Peppers are rinsed under cool running water. Using a cutting board, the tops are cut off and discarded. Then, cut the Green Peppers into large pieces. Discard seeds and inner pulp. Cut the large pieces into strips. Place Pepper strips into sandwich bags and close. The filled/ closed bags are placed in a Gallon sized freezer bag, labelled and sealed. 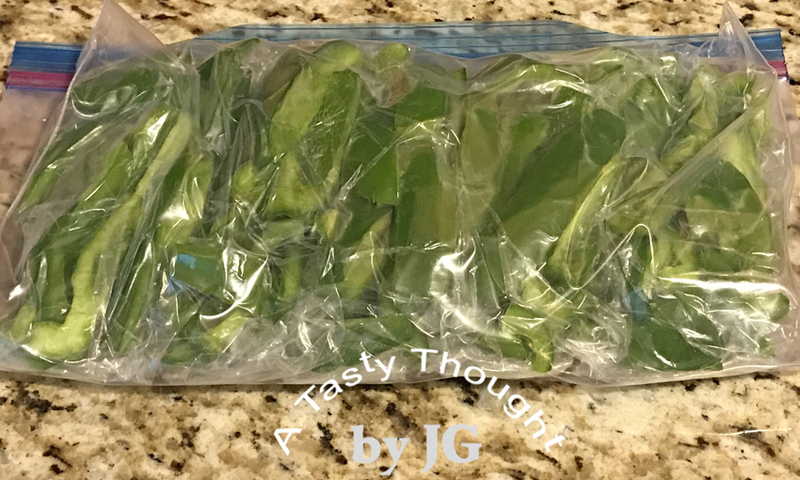 Reaching into my freezer and taking out a bag of Green Pepper strips to use will be a great find this coming winter! Ten bags should be enough. This is definitely the time of year to purchase the fresh local Peppers to freeze. If you have the opportunity to do this, it is worth the small effort! Good, Judy! I love green peppers and use them year round. You're right about their appearance at the grocery store in the wintertime. I've never tried freezing them, just thought they'd turn to mush when thawed. Thanks for sharing! Pam- Easy to do and great to find them ready to use in the freezer!